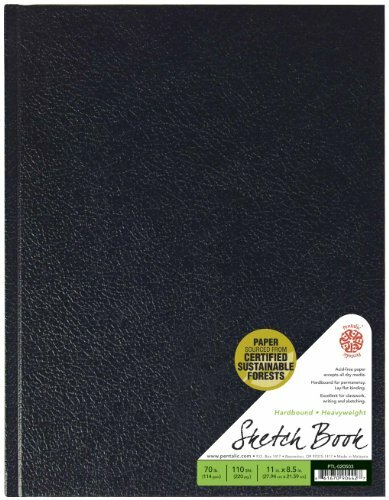 This Pentalic Hardbound 8.5x11 Inch Sketchbook contains 110 sheets of white, 70 pound (144 gsm), acid-free paper. The sturdy, elegant cover features a leatherette texture and keeps your artwork and notes intact while providing a firm drawing surface. The hardbound spine is specially designed to lay flat while in use and conveniently stands upright on a bookshelf. This book is perfect for sketching, writing, and classwork. Paper is sourced from certified sustainable forests. If you have any questions about this product by Pentalic, contact us by completing and submitting the form below. If you are looking for a specif part number, please include it with your message.